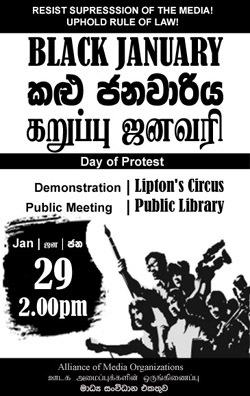 6th January 2008, Colombo, Sri Lanka: A number of journalists in Sri Lanka have received credible information that underworld gangs have been ordered to threaten, harass and even kill them for their involvement in protests held in response to the outrageous behaviour of Government MP Mervyn de Silva recently. Mervyn de Silva, the Minister of Labour, stormed into the State run television station Sri Lanka Rupavahini Cooperation (SLRC) on 27th December 2007 with a group of thugs, that we now know included murderers and underworld drug dealers, and brutally assaulted its News Director, Mr. T.M.G. Chandrasekara. Journalists and staff of the SLRC and their colleagues from media organizations mobilized around the offices of the Chairman of SLRC to barricade the Minister and his motley array of thugs until the arrival of the Police and the Minister apologized for his behaviour live on camera. Though the FMM regrets that the situation escalated to the point that the Minister and one of his thugs were assaulted, we understand the enraged feelings of the journalists who had to face such an unprecedented attack on media. The FMM is now deeply disturbed to hear that instead of immediate and stern disciplinary measures taken against the Minister, of which to date there has been none, underworld gangs in collusion with senior politicians are planning to intimidate and even murder some journalists involved in this incident. Three leading media personnel of the MBC TV and Radio network that covered the incident extensively – the head of MTV Chevaan Daniel, Sirasa Director Kingsley Ratnayaka and Sirasa News Director Susil Kedelpitya – have lodged complaints to the Maharagama police over death threats they have recently received. Their complaints record the names of underworld persons who have been given contracts to kill them. Even more shockingly, the FMM has received credible information that Sanath Balasuriya, President of the Sri Lanka Working Journalists Association (SLWJA), Dharmasiri Lankapeli, General Secretary of the Federation of Media employees Trade Unions (FMETU) and a number for other senior journalists, trade union and media activists may be targets of assassination attempts related the SLRC incident. FMM, together with all Sri Lankans committed to liberty, human rights and democratic institutions, is appalled by the course of conduct adopted by the President in which he has now become the focus of attention in respect of bad governance, maladministration, and of defending the indefensible. We are at a loss to understand how the President can, with good conscience, persecute journalists of the SLRC whilst shielding his errant Minister, in blatant violation of every applicable democratic ethic. We note with great concern that the SLRC incident and its aftermath proves beyond an iota of doubt the President’s and his government’s complete and utter disregard for the Rule of Law and democracy. This despicable culture of impunity and State sponsored terror places journalists who report on the gross abuse of power in untenable positions of having to fear for their lives and those of their loved ones. We place the security of all those so threatened squarely in the hands of the Government and the President. The responsibility is theirs and theirs alone to ensure that all journalists and media personnel facing the threat of physical harm are afforded the fullest protection from underworld criminal elements and that MP Mervyn de Silva is urgently brought to book for his deranged abuse of power. Please write to register your deep concern in light of these developments and to request that meaningful remedial measures are taken urgently to restore public confidence in the rule of law in Sri Lanka. The Free Media Movement is a non-partisan independent group of journalists, newspaper editors and media personalities who are committed to freedom of expression, opinion and information. We have launched our Human Rights Prize Programme. For details please go here. Don't forget to visit our old website for more Press Releases, Reports and details of previous initiatives by the FMM.